The footings of most foundations are placed below the frost depth. In colder areas of the United States, this can mean excavating and pouring concrete 4 ft. or more below grade. 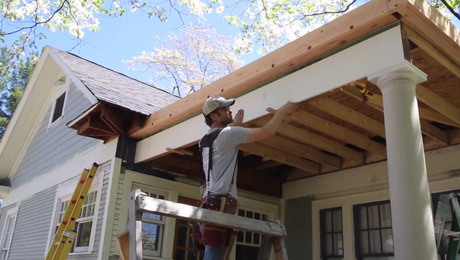 If you include enough rigid-foam insulation around a foundation, however, you can keep the soil under the house warm enough to permit shallow excavations, which can be 12 in. or 16 in. deep, even in northern areas. 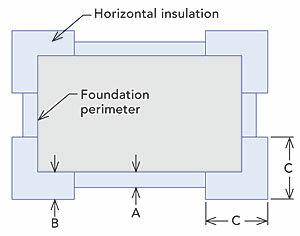 So-called frost-protected shallow foundations usually consist of a monolithic (thick-edged) slab wrapped with vertical and horizontal rigid-foam insulation. 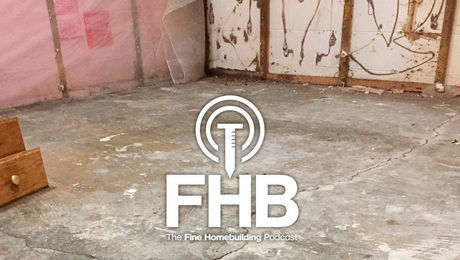 Although the International Residential Code (IRC) does not require a shallow foundation to have insulation below the slab, omitting the subslab insulation is not a good idea. 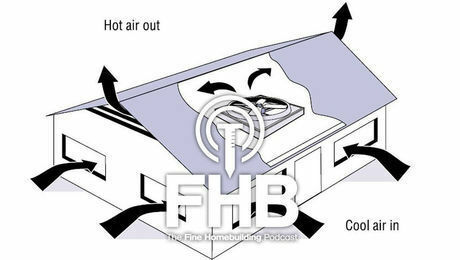 After all, the more insulation you have under the slab, the less heat will leak out of your house into the soil below. Fortunately, these shallow foundations don’t depend on leaking building heat to keep the soil warm. Instead, horizontal wing insulation extending from the bottom edge of the slab helps to retain the natural warmth of the earth. 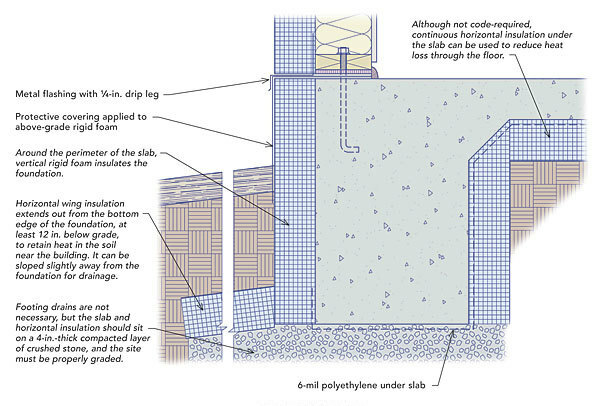 Either extruded-polystyrene (XPS) or denser types of expanded-polystyrene (EPS) insulation may be used to insulate a frost-protected shallow foundation. To account for the possible performance degradation of foam insulation that remains buried for years, designers “derate” the presumed R-value of XPS from its nominal value of R-5 per in. to R-4.5 per in. 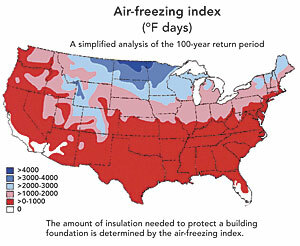 The amount of insulation you’ll need depends on the air-freezing index in your area. Coincidentally, because of existing energy-code requirements, you may already be insulating your foundation walls enough to achieve the necessary R-value for a shallow foundation. Let’s say you’re building a frost-protected shallow foundation in a Minnesota town with an air-freezing index of 2500. 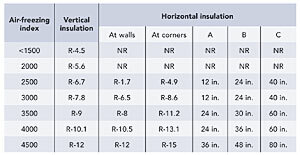 According to code requirements for frost-protected shallow foundations found in Table R403.3 of the IRC, the minimum R-value of the vertical insulation at the perimeter of the slab is R-6.7 (about 1-1/2 in. of XPS). Ironically, the energy section of the IRC, which applies to all types of slabs, not just those that are frost-protected, requires more slab-edge insulation, R-10, for slabs commonly built with full-depth footings in this climate zone. The R-value for the horizontal wing insulation in this example is R-4.9. Table R403.3 also specifies the minimum width and configuration of the wings. Now that minimum energy-code requirements for slab insulation have overtaken the design requirements for a frost-protected shallow foundation, the line between a “conventional” slab-on-grade foundation and a frost-protected shallow foundation has been blurred. As a result, almost any monolithic slab complying with energy-code requirements can be turned into a frost-protected shallow foundation by adding the required wing insulation. Frost-protected shallow foundations have the following advantages over deeper conventional foundations.• They require less excavation, so smaller equipment and less labor are involved. • Less concrete is consumed. • Monolithic slabs are formed and poured in one shot, speeding the work schedule. • They typically cost 15% to 21% less than a conventional foundation, according to a study by the NAHB Research Center. Frost-protected shallow foundations don’t make sense everywhere, though. • If you live where frost depths are already shallow, don’t expect any savings in labor or material, although an insulated foundation may save energy dollars later. • Frost-protected shallow foundations aren’t appropriate for steeply sloped sites or sites with permafrost. • In areas that are heavily infested with termites, including the southeastern United States and most of California, the use of below-grade rigid-foam insulation is not necessarily a good idea. • Deep-rooted perennial plants shouldn’t be planted above the shallow wing insulation that surrounds a house with a frost-protected shallow foundation. 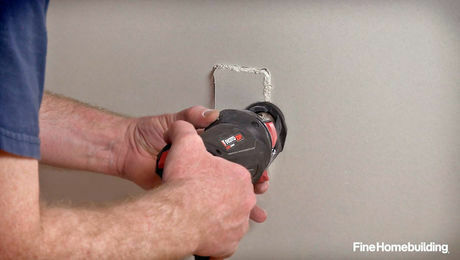 • The above-grade portions of the vertical foam insulation surrounding a shallow foundation need to be protected with a durable finish material, such as Protecto Wrap, Protecto Bond, or stucco over metal or fiberglass lath. Because most rigid insulation is either 24 in. wide or 48 in. 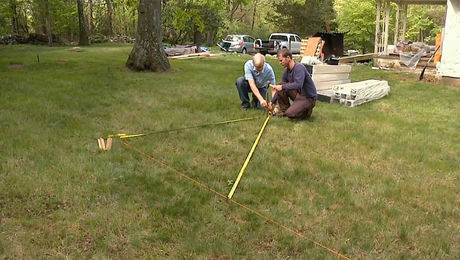 wide, it makes sense to design a frost-protected shallow foundation to be 24 in. deep at the perimeter, with 16 in. below grade and 8 in. above grade. Monolithic-slab foundations require a perimeter trench. If vertical insulation is installed inside the formwork before the pour, the trench and the foam board can act as the lower section of the form. 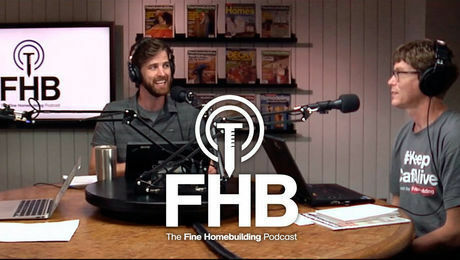 To calculate the necessary R-value of the foam needed for a frost-protected shallow foundation, most designers look up the air-freezing index for the area in which they are building. The higher the index, the colder the climate. Design guidelines for frost-protected shallow foundations can be found in an American Society of Civil Engineers publication, “Design and Construction of Frost-Protected Shallow Foundations” (ASCE 32-01). However, most residential builders will probably find it easier to follow the prescriptive requirements for these foundations in section R403.3 of the IRC, also shown here.